This toolkit is intended to provide a compilation of information and resources to support agricultural water conservation in the Pajaro Basin. It draws on the efforts of many experts and resource providers to provide pertinent information to help Basin growers improve their irrigation practices and conserve water in their operations, both to respond to the Central Coast’s current extreme drought conditions, and to reduce demand on the Basin’s overtaxed groundwater resources. Potential benefits of optimizing irrigation include a more uniform crop in terms of plant health and yield, along with water and energy savings. Use of the practices and information in this toolkit should help with your operation’s bottom line. Compilation of the content in this toolkit has been guided by input from a Technical Advisory Committee comprised of Paul Robins and Ben Burgoa of the Resource Conservation District of Monterey County, Michael Cahn of the University of California Cooperative Extension, and Dan Johnson of the Natural Resource Conservation Service State Office, and grower representatives. Toolkit content will be regularly reviewed and updated to reflect most current research, strategies and tools. PV Water provides the contact information for private sector service providers in this toolkit as an information service only. The agency accepts no responsibility for the performance of the private consultants/contractors listed and makes no representation, either expressed or implied, regarding their competence or expertise. Irrigation is the most important human use of water, after drinking. According to the United States Geological Survey, almost 60 percent of the world's fresh water- from lakes or rivers or accessed from the ground through a well -is used for agricultural crops. Large-scale farming could not provide food for the world's populations without the irrigation of crop fields with water from rivers, lakes, reservoirs, and wells. Without irrigation, some of the most fertile land in the world would never grow crops. Irrigation has been around for as long as humans have cultivated plants. Ancient people hauled buckets full of water to pour on their gardens. Pouring water on fields is still a common irrigation method today; but when it’s possible, other, more efficient and mechanized methods are used. About 90 percent of the water used in our homes and industry is eventually returned to the environment where it replenishes water sources (water goes back into a stream or down into the ground) and can be used for other purposes. But of the water used for irrigation, only about one half returns to surface or groundwater sources. The rest is lost by evaporation into the air, evapotranspiration from plants, or is lost to evaporation during conveyance. Generally, water lost in conveyance is not reusable for further irrigation or other uses; however, leakage from an irrigation ditch or pipe can provide other benefits, including percolation to a groundwater source (a good thing, unless there are chemicals in the water), or support habitat. When these objectives have been codified by local, state or federal government oversight agencies, the regulatory process will legally compel conservation actions and usage restrictions. In the Pajaro Basin, most of our water is pumped from underground aquifers. If we pump too much, those aquifers shrink, leaving room for salty ocean water to move into the space created by reduced “head”/pressure in the freshwater aquifer This is called saltwater intrusion, and it ruins wells, destroys water resources, and makes farming the fertile land above saltwater intrusion much more difficult. In drought years, demand on the underground aquifer increases, and so does the risk of saltwater intrusion. In California, drought comes frequently and persistently. Since 1918, there have been ten multi-year serious droughts, including the current drought that is now entering its third year. California has been in drought for 7 of the last 13 years. To ensure a healthy aquifer, everyone who lives and works in the Pajaro Basin needs to conserve water as a regular practice. For agriculture, the question is not whether you need to conserve water in your operation; it’s what strategies will provide a grower with the greatest conservation through irrigation efficiency. It’s a given that growers need to both conserve water and keep their operations viable. We’ve arranged our toolbox to correspond with these steps. Clicking on a step will take you to that group of tools and strategies, and you’ll find brief explanations of each topic, links to more information and resources for help and service. For some growers, many of the tools presented here will seem familiar. Some may find much of this information new. There are resources available to help you develop the best plan and strategy for your operation, and to help link you to programs that can help fund and support the system modifications you may need. 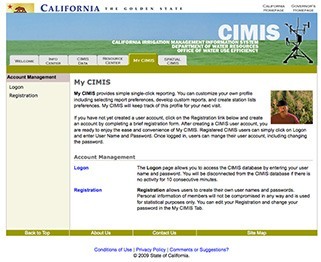 Clicking on the links below will take you directly to a list of professionals who can help you with every step of fine-tuning your system to achieve greater irrigation efficiency– from helping you get a distribution uniformity test done to helping you find cost-share and grant funding for evaluation and system modifications. Financial Support to implement irrigation efficiency improvements. Finally, after you’ve worked with the toolkit for a while, please give us feedback about how useful you find the information, if there is any other water conservation information you’d like to see covered, or if you’ve found any errors. We want to make this the most useful resource we can. Thank you! In order to optimize your water use efficiency, you first need to assess how well your irrigation system is performing, if water and energy are being lost, and if water is being applied to your crop evenly. To do this, you will want to conduct some kind of irrigation audit or evaluation. The information you develop by evaluating your system will help you choose strategies to achieve both maximum crop performance and maximum water conservation. Ideally, irrigation system evaluation is done initially to assess the starting efficiency of the irrigation system and to identify areas for improvement; and again after each major system change, to verify that system improvements are performing as planned and to ensure conservation goals are being achieved. Evaluation of agricultural irrigation systems ranges from an intensive (and very expensive) Irrigation Audit that examines every aspect of a grower’s irrigation system, from pump to field, to focused evaluations that target specific elements of the irrigation process. In the Pajaro Basin, irrigation system evaluations focus primarily on evaluation of Distribution Uniformity (DU), system design and operation review. Because of the ongoing drought and water shortages facing the state of Texas, on farm water conservation has become the rule, and the Texas Water Development Board developed a comprehensive Irrigation BMP for growers. 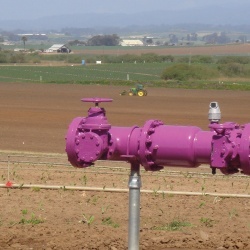 This more comprehensive evaluation provides information that growers would likely find useful, and is worthwhile to consider as the Central Coast continues to develop and refine its irrigation evaluation program. Take flow measurements (from emitters, sprinklers, sprayers or other emission devices) and pressure readings at mapped locations throughout the field to identify variations. Then calculate the DU. Follow the water from the source to the furthest point of the irrigation system to check for leaks and other problems. Discuss report and recommendations with grower, including irrigation scheduling, soil moisture monitoring and plant irrigation needs. After you’ve evaluated the performance of your system, you’ll be provided a confidential report that recommends practices or system design changes to optimize your water use. You’ll be ready to consider the key questions: How much water are you applying to your crops? How much water do your crops actually need? How do you decide when to irrigate? You’ll make some decisions about a variety of practices and strategies to increase the water use efficiency by fine-tuning your irrigation system to your crop, your soil and the climate. Once you’ve evaluated all the components that will impact your irrigation system, you’ll likely want to make system modifications to improve the distribution uniformity and address any additional problems. The tools below are very specific to your crop needs and budget constraints. Conversion from surface (furrow) or hand line sprinklers to micro irrigation should improve DU and provide other benefits, including healthier plants and soil. Improving an existing micro irrigation system by inspecting and replacing plugged hoses and implementing a regular maintenance program to keep hoses clear and flowing will also provide improved water use efficiency on a smaller but still meaningful scale. 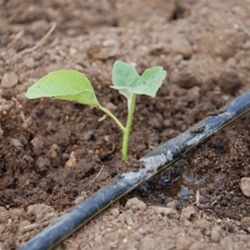 Drip irrigation (also trickle or micro irrigation) involves emitting water at a very slow rate directly to the soil where the roots of plants are growing. Emitters can lie on the surface of the soil or be buried just below the surface. A well-designed drip irrigation system has the highest distribution uniformity (given each is excellently designed and maintained, a drip system can achieve upwards of 90% DU (distribution uniformity) ; compared with 85% DU for a microsprinkler system, 80% DU for a sprinkler system and 60% DU for an unimproved surface irrigation system- Michael Cahn, UCCE) Because there is very little wetted soil surface area, and the water doesn’t travel through the air as it does in sprinkler irrigation, there is very little opportunity for water loss due to evaporation. In addition, the control provided by micro irrigation allows the grower to optimize irrigation scheduling decisions. The very slow water application rates used in drip irrigation require very small orifices. These small orifices are easily plugged with very small bits of debris and make a good filtration system mandatory. Inadequate or poorly maintained filtration is a common source of low DU in such systems. Associated improvements in a micro-irrigation system are commonly recommended for efficiency improvements. High filtration requirements and the necessary tubing to get the water placed directly at each plant make drip the highest initial cost per unit land area irrigation system. 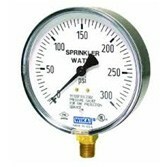 Once installed, drip usually operates at much lower pressures than sprinkler, which means less pumping power is used. This usually results in significant energy savings and lower power bills. Easily automated, because the distribution system is always in place and ready to be used, drip allows the most control over irrigation timing and amounts and requires less labor to irrigate- another cost savings. Drip is suitable to all soil types because of its extremely slow application rate and high degree of control over timing and amounts. Plant foliage stays dry with drip and therefore there are fewer problems with plant diseases that thrive on wet leaves and in humid conditions. Because a large portion of the soil surface always stays dry, there is less weed germination in the inter-rows, and drip irrigation systems make fertigation and chemigation easy and convenient. Drip irrigation usually requires less field labor, but more skilled or educated management than sprinkler or surface irrigation. All components of a sprinkler system will work best if they are well designed for their application. A DU evaluation may result in recommendations for design improvements, such as shortening of lateral lines and reduction of move distances, a pump system upgrade or change out of nozzles. For growers who use sprinkler-based irrigation systems, nozzles are an important component. Good low pressure nozzles can significantly reduce the cost of pumping water, improve water uniformity when pressure and nozzle spacing are aligned, and result in higher yields, result in fewer line breaks and less maintenance. PGE offers rebates to customers convert from a high-pressure sprinkler system to a low pressure nozzles. Pressure Gauges enable growers and irrigation system specialists to evaluate irrigation water pressure at various locations in the system. With this information, the system operator can make changes to improve distribution uniformity (DU) and achieve greater irrigation efficiency, conserving water. Pressure regulators help to insure that the flow rate of the water being delivered through a sprinkler, drip or micro system is delivered at the correct pressure required by the irrigation system, which is essential for the system to distribute water uniformly throughout the field. The greater the distribution uniformity (DU) in an irrigation system, the greater the water conservation will be. Good DU means you can apply just the required amount of water to all the plants in a given field, rather than overwatering some and under-watering others, which can happen when DU is low. So- a good pressure regulator, while not the most expensive tool in the box, is a very important element of on-farm water conservation. System leaks are sources of irrigation water waste, which the Pajaro Basin cannot afford. Yet as in all systems, breakage, and failures occur. Regular system checks to insure that leaks are caught early and repaired quickly is essential. Gently sloped furrows help the water to soak into the soil. The water that leaves the field flows slowly, leaving the soil in place. 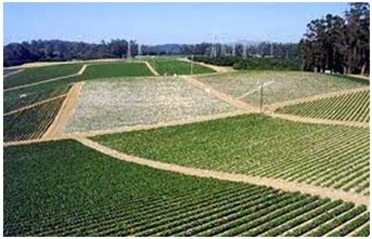 Good row arrangement also helps to achieve more uniform irrigation, fertigation and drip fumigation by reducing potential for extreme pressure differences between the tops and the bottoms of rows; less ponding of water in furrows; ease of harvest; professional looking fields; and reduced erosion control and clean-up expenses. Hillslope Management Runoff Guide has more information about row arrangement and other techniques for farming on hills from the RCD of Monterey County. Tailwater is the water that remains after surface irrigation has passed over a field. Since this water has crossed over the ground where the crop grows, it has been exposed to and may have picked up chemical residue from pesticides and fertilizers, as well as animal and insect wastes deposited in the field. Current food safety concerns render tailwater a difficult substance to manage in fresh market vegetable crops. The most common management practice involves constructing a tailwater recovery pond or ditch structure to hold the water as it runs off the field, with a pump to return water to the distribution point for reuse. A surge irrigation system may improve DU and reduce runoff. It works by applying water intermittently to furrows so as to create a series of on-off periods of either constant or variable time intervals. Surge flow can also increase the amount of water delivered to each furrow, improving DU.. Surge irrigation is typically applicable to agricultural fields with medium textured soils. Surge irrigation may have limited applicability to fields with heavy clay soils or light sandy soil. The benefit of surface irrigation is that it uses gravity rather than diesel or other energy to move water to the crop. In severe drought, saving water is generally a higher priority than saving energy, though the two are often connected. If economics or other considerations require that you use surface irrigation, installing surge valves will increase irrigation efficiency. Controllers on surge valves allow growers to manage the duration of the wetting and soaking cycles, adapting those cycles to plant and soil requirements. Land leveling is used to increase the uniformity with which water is applied to a surface irrigated field. The term “Land Level” generally applies to mechanized grading of agricultural land based on a topographic survey, and only in special situations does the final product of land leveling result in a level field. Most land leveling is done using a laser-controlled scraper pulled by a tractor. The laser is set to predetermined cross and run slopes, and the scraper automatically adjusts the cut or filled land over the plane of the field as the tractor moves. 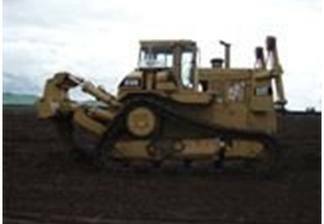 Land leveling is typically used on mildly sloping land. A variety of tools are available to help you apply irrigation water more precisely. Each provides you with information about a specific part of your irrigation system. Since knowledge is power, using these tools in concert will provide more power to control water use and provide the ideal water to your crops. Flow meters measure the total volume or the flow rate of water. Flow meters are vital to accurately determine the irrigation system application rate for irrigation scheduling; they also allow growers to measure their total water applications. 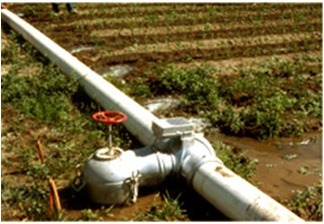 When flows vary from normal flow meters will indicate irrigation system problems. 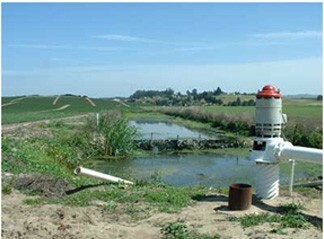 Here are two flow meter options frequently used in the Pajaro Basin. 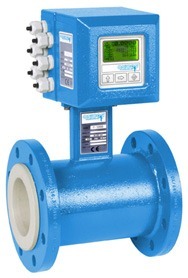 Propeller flow meters are the most common devices used for measuring water flow rate. 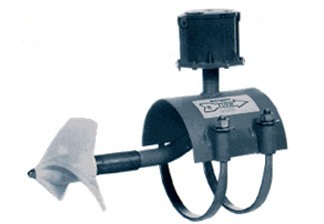 A propeller flow meter measures the velocity inside a pipe and shows the flow rate reading on a dial. Each of these meters are designed for a specific pipe size and work best within particular ranges of flow. With adapters one flow meter can be used to measure several pipe sizes. The two main types of flow meters are saddle and flanged. Saddle meters are placed through a hole in an existing or specifically used pipe. Flanged flow meters are placed in between an existing flanged joint. When meters will be used on more than one site, irrigators have found it convenient to couple them to a designated section of aluminum or PVC pipe. 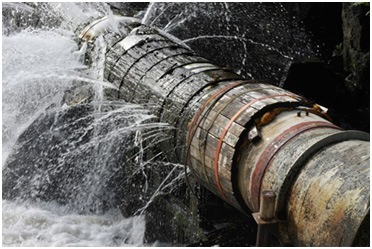 Electromagnetic flow meters measure the velocity of conductive liquids, like water, in pipes. This type of flowmeter does not obstruct flow and does not require much upstream and downstream straight run, so they can be installed in relatively short meter runs. Electromagnetic flowmeters typically require 3-5 pipe diameters of upstream straight run and 0-3 pipe diameters of downstream straight run measured from the plane of the magnetic flowmeter electrodes. In contrast with many other flowmeter technologies, electromagnetic flowmeter technology produces signals that are linear with flow. As such, the turndown associated with magnetic flowmeters can approach 20:1 or better without sacrificing accuracy. Irrigators who monitor soil moisture levels in the field greatly increase their ability to conserve water and energy, optimize crop yields, and avoid soil erosion and water pollution. Low-cost soil moisture monitoring tools and methods, ranging from using a shovel or relying on hand feel, to a new generation of sophisticated electronic devices, can help growers make use of soil moisture information. Whatever method used, the key to irrigation efficiency is a system where the grower can relate soil moisture to crop water need, and make irrigation decisions accordingly. As mobile technology becomes better and more affordable, applications to assist in irrigation scheduling have been developed that growers can access both on their home computers and through their smart phones and tablets. Two of these systems are free to use, and the others are privately developed programs and applications, for use by paid license. All of them provide growers with a great deal of highly accurate information to aid in irrigation decision making. 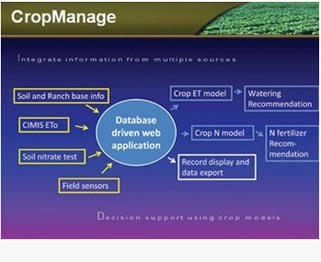 CropManage is an online database-driven tool that assists growers and farm managers in determining water and nitrogen fertilizer applications on a field-by-field basis. The software automates steps required to calculate crop water needs from CIMIS Reference Evapotranspiration (ETo) data, and estimates fertilizer N needs for lettuce using quick N test data and models of crop N uptake. The web application also helps growers track irrigation schedules and nitrogen fertilizer applications on multiple fields and allows users from the same farming operations to view and share data. CropManage has strict privacy protections in place and does not share any information about users with other entities. This system is still in development. New features are being developed and added. Recommendations are currently specific for romaine and iceberg lettuce production. Cooperative extension plans to expand CropManage to a wider group of cool season vegetables as funding permits. Crops under development to add to the system include strawberries and broccoli. This is a growing field. Below are three proprietary systems available to Pajaro Basin growers. Follow the links to each company’s website for more information about service and pricing. 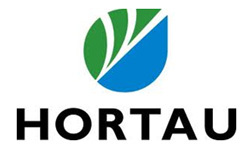 Hortau specializes in wireless and web-based irrigation management. Hortau integrates proprietary soil sensing innovations with the latest information technologies to deliver the most advanced irrigation management solutions on the market. 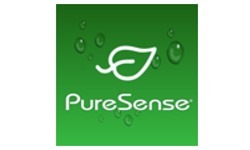 Pure Sense offers a suite of web-based monitoring programs to enable growers to follow their irrigation from “pump to root”, fine-tuning each step for maximum water conservation and plant success. Rain Bird’s system uses mobile network technology to send key data directly from the field via mobile phone, computer or tablet. The program monitors soil, weather, plant conditions and more; it controls water irrigation; offers a low cost wireless technology on your field and is easy to learn and use. Contact Rain Bird Ag for more information. 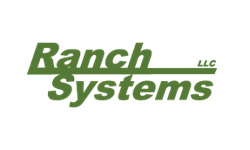 Ranch Systems focuses on wireless solutions for field monitoring and control in agricultural and environmental applications. The patented technology is highly modular to offer a variety of the possible applications: from a single cellular node monitoring a single temperature or tank, all the way to sophisticated farm-wide networks with real-time wireless monitoring and control of the entire growing and irrigation cycle, with add-ons like camera monitoring. For more information, contact Ranch Systems. Undertaking even modest water conservation improvements to your system can stress a busy grower. Fortunately, there are good resources available to help make the process easier. Financial help for growers who improve water conservation in their operations is available through rebates, cost-share programs and small grants. These programs change with local, state and national priorities, so the information in this section will be regularly updated to reflect current financial help programs. 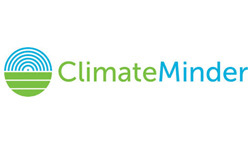 Administered by the Central Coast Ag Water Quality Coalition (Coalition) to help growers with irrigation system audits and improvement recommendations. You should note the pending Prop 84-funded programs that RCDSCC will have available in the area. PV Water and the Coalition will provide cost share/application assistance to growers. Watch this space for more information. This toolkit is an ongoing work in progress. We will be regularly reviewing, editing and updating toolkit information to keep it as current and relevant as possible. We encourage everyone who uses the toolkit to help us make this the most useful resource possible, and to contribute new information, corrections, and ideas for improvement. Please contact with any comments or additions. A brief description of the service you provide.